When I wrote up Friday’s activities, I had this crazy idea I’d write a short report from the convention floor every evening. Didn’t happen. At the end of each day, as soon as I no longer had to be on or responsible for anything, I just melted into a vague fog and passed out. What follows are the few highlights I managed to catch between duties and hasty catch-up chats in the hallways. 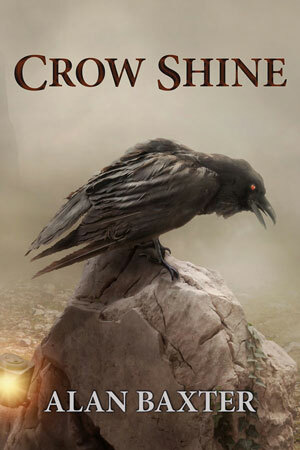 I missed most of Saturday, having arrived late and leaving early; the main thing I made sure to attend was the sneak pre-official launch of Alan Baxter‘s first collection, Crow Shine from Ticonderoga. 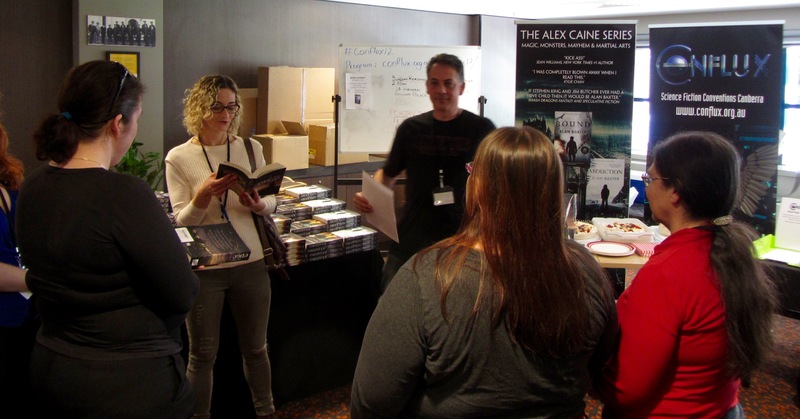 Alan, who was the Guest of Honour at this year’s Conflux, is a terrific dark fantasy storyteller, with liberal doses of 80’s Vertigo comics and martial arts movies in his blood. I love his stuff and I’m very keen to dig into this collection. Alan crushed the “enticing book launch freebies” stakes by offering miniature bottles of book cover-labelled moonshine. Here’s Alan on Sunday, being interviewed as Guest of Honour by Rob Hood. (I missed the International Guest interview of Dave Wolverton the previous morning, conducted by my mate Tim Napper). 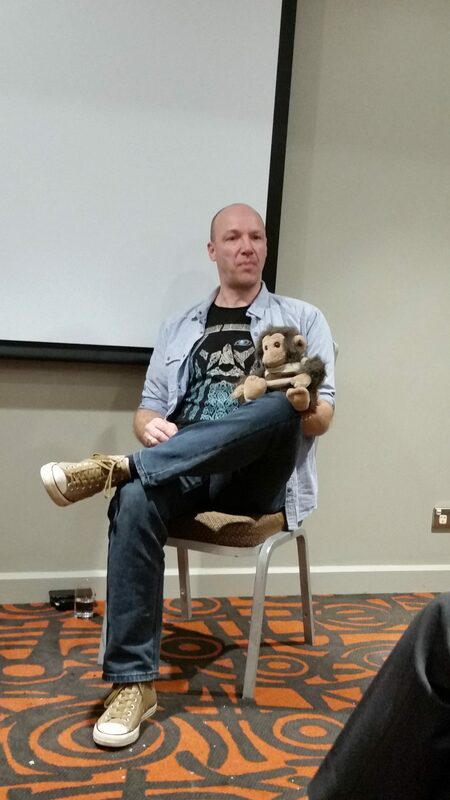 It was a great discussion of Alan’s history with writing and martial arts, though one of the highlights was the Q & A where Rob encouraged the audience to throw Eric the plush Demon Monkey at Al while he thought about his answers. 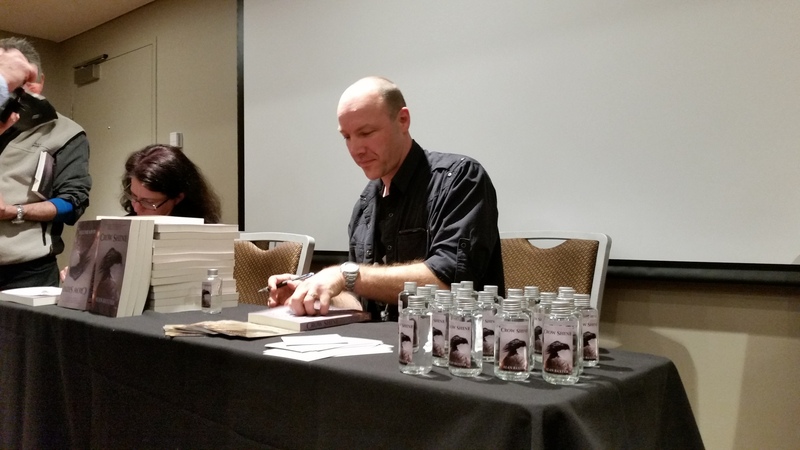 At midday on Sunday I hosted the Canberra launch of At the Edge. Jo Anderton read from her story “Street Furniture” (one of my absolute favourites from the anthology). I got nervous and thought – very incorrectly – we were running over time, so I skipped my reading. (For the record I would have read a page or two following on from the exclamation “Chupacabra!” – because you don’t just gratuitously insert a word like that in a story and then not use it). Other than the fact that I don’t know how linear time works, the launch otherwise went off without a hitch – we raffled off the print of the cover, and I fed a small army of gathered con-goers of fruit-slathered pavlovas. We *may* also have sold a couple of books, I’m not sure. On Sunday afternoon I went to what I immediately declared the highlight of my convention, which was the live recording of Verity! podcast with Tansy Rayner Roberts, Kate Orman and Tehani Wessely. 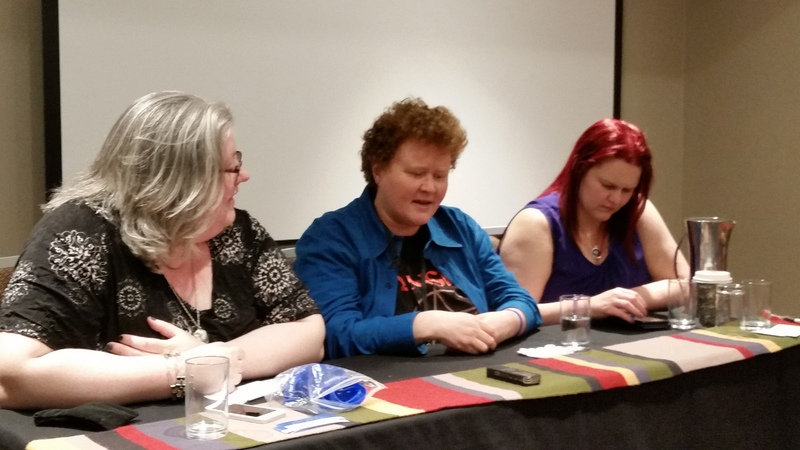 The discussion centred mainly on the so-called “Wilderness Years” of Doctor Who, when the show was cancelled and authors including Kate Orman were pumping out sometimes two or three new novels a month for nearly fifteen years. It was a lively and hilarious panel, especially when Kate and Tehani were challenged to defend terrible moments from the show’s past, like the burping Auton bin in “Rose” and (my own contribution) the Doctor motivating Sarah-Jane to escape a narrow air duct by insulting her hips. Kate’s one-minute ad-lib deconstruction of the character’s relationship was both wonderfully insightful and laugh-out-loud funny. Shortly after that, Tansy and Tehani shared a bittersweet moment with the launch of Tansy’s new Mocklore book “Bounty”. Great for Tansy to have one more book in her piratical adventure-fantasy series, but sadly, it will be the last book coming out from Tehani’s FableCroft Publishing for the foreseeable future. I sincerely hope the hiatus is temporary – Tehani has been putting out some exceptional books over the last few years. Hopefully not the last FableCroft launch ever! Monday was another hazy blur. My chief contribution to it was to host the hastily-rescheduled Flash Fiction contest. Random passers-by were pressed into writing very short stories from a writing prompt, and then reciting them for the assembled crowd. By dint of overwhelming applause, this year’s fetching plastic trophy was won by Rik Lagarto, who shamelessly pandered to the crowd by writing a story that featured me being shot in the head. What an absolute disgrace. Congratulations, Rik! And then it was done – the closing ceremony, the packing up, and a quiet drink (also known for whatever obscure reason as the Dead Dog Party) in the Novotel bar afterwards. 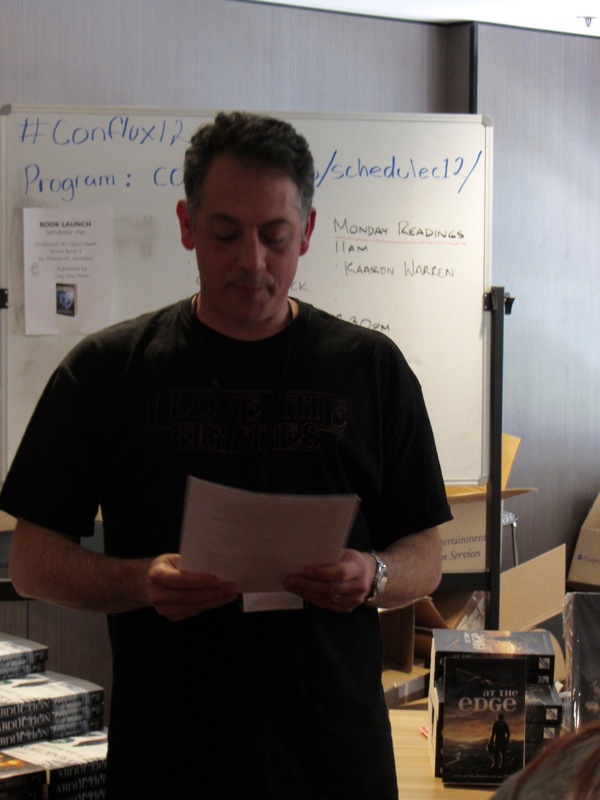 I’ll post up a blog of pictures from the closing ceremony over at the Conflux website shortly. 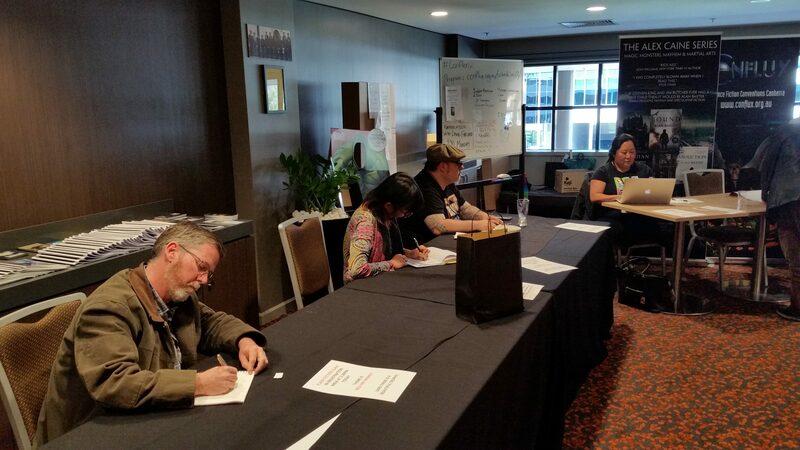 For now – these are the weary veterans of Conflux 12: Red Fire Monkey at the bar. No doubt they are contemplating next year’s Conflux 13: Grimm Tales. This entry was posted in Announcements and tagged alan baxter, at the edge, Conflux, dave wolverton, fablecroft, jo anderton, rik lagarto, rob hood, tansy rayner roberts, tehani wessely, ticonderoga publications, tim napper, verity podcast, vertigo comics. Bookmark the permalink. Bravo! Sounds like a good time was had by all. I reckon you should put up a YouTube video of you reading the extract you *would’ve* read – if not, I will pretend to be you and do it.